Indiaplaza Blog For smart shoppers |: It's better to light a candle than curse the darkness!!!!! It's better to light a candle than curse the darkness!!!!! Candles have a unique place in our society today, and are also a link with our past. Candles have been used for light and to illuminate man's celebrations for more than 5,000 years, yet little is known about their origin. It is often written that the first candles were developed by the Ancient Egyptians, who used rush-lights or torches made by soaking the pithy core of reeds in melted animal fat. However, the rush-lights had no wick like a true candle. Candles have come a long way since their initial use. Although no longer man's major source of light, they continue to grow in popularity and use. Today, candles symbolize celebration, mark romance, soothe the senses, define ceremony, and accent home decors — casting a warm and lovely glow for all to enjoy. Candles come in virtually every shape and size imaginable. Some of the majorly used candles are Taper, Pillar, Votive Gel, Jar or Filled, Tea Light, Printed Glass Candle, Floating Candles, Scented Candles and many more. Everything seems lovelier by candlelight. 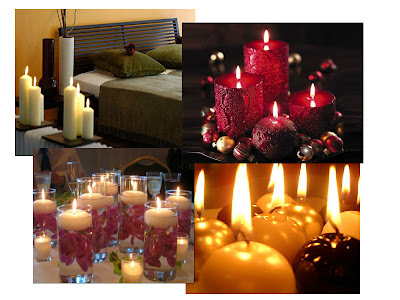 Candles can add warmth, style and ambiance to any room in the home. Whether grouped for drama in the living room, paired in candlesticks on the dining table, or snuggled in colored glass votive on the mantel, candles add elegance and style to homes around the world. Scented candles are great for any room in the house, but unscented candles are best for dining. Scented candles can conflict with the aroma and enjoyment of your food.